Gov. 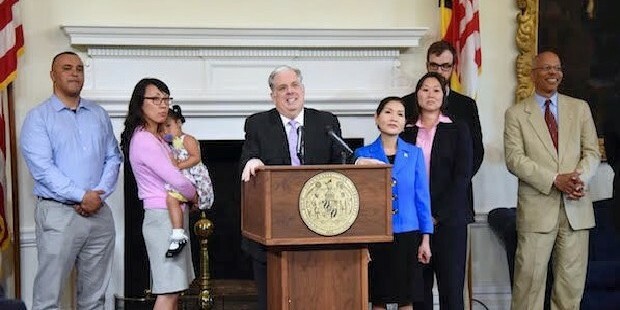 Larry Hogan announces his cancer diagnosis and treatment with wife Yumi and family members at his side, and Lt. Gov. Boyd Rutherford on far right. For weeks, we’ve been anticipating a major announcement from Gov. Larry Hogan up or down on the Purple Line. But as his family filed into the State House reception room Monday afternoon, even from afar, it was clear this announcement was not about mass transit. As is typical with this tight-lipped administration, word had not leaked about the shocking news that the governor had a very virulent form of cancer (lymphoma) that was eating him up from within. There had even been some misinformation about a bug he caught in Korea on a trade trip. Five months to the day since he took office, Hogan was again confronted with the awful and unexpected as he had been with the Baltimore uprising in April. This time the disruption was more personal, and he confronted it in the same way; plain, direct, forceful and with considerably more humor than could be expected. The state of emergency this time was his own. He lightened the scary announcement by joking he had “much, much better odds” at beating the big C than he had beating Anthony Brown last year. Hogan may have been one of the few people early on to actually believe he could defeat Brown. But having seen that resolve carry him on an improbable path to victory, defeating this disease seems less improbable. Even as spoke of this battle, and the 18 weeks of aggressive treatment, he stayed on political message. You probably won’t see it on most of the TV clips, since it sounds like a loop of his campaign speech, but as he talks about the odds in this fight being better than the odds on repealing the rain tax, delivering tax relief, reining in state spending without tax increases or reducing tolls. Given those odds, this guy does not expect to lose this fight. Hogan’s decision to choose Boyd Rutherford as lieutenant governor looks even wiser in this perspective of a man who will need a good second-in-command to run the government when he is ill. As secretary of the Department of General Services in the Ehrlich administration, Rutherford acquired a wide knowledge of state government, and attended scores of meetings of the Board of Public Works that he will be chairing more often. Low-key, steady and less political, Rutherford seems a good complement to a governor always in a campaign mode. Hogan insists he will continue to work at running the government. Yes, he’ll lose his hair — adding to the growing collection of photos of Hogan in hats — and lose some weight. It’s likely that on some days the governor will look like death warmed over. But he has promises to keep, and he made this last promise. If he does overcome the Big C, the big Ds of Mike Miller and Mike Busch won’t look so formidable.